You may remember this gorgeous yellow maxi skirt I posted earlier this year. Well this beautiful skirt now comes in lovely shade of light pink and I couldn’t resist showcasing it’s flowiness on the Brooklyn Bridge in NYC (by the way it is super hard to wake up early and get a shot on the bridge empty and in heels!) This skirt has layers of full fabric that make it extra flowy and special. I just love how it moves when I walk! I also love that I did not have to hem or alter this skirt. I wore it high-waisted and with 4″ heels and it fit perfectly. And better yet, Morning Lavender is having a private SALE just for Friends & Family! And because you all have become like family to me, I am happy to share this code with y’all! Use the code MLFF20 to save 20% OFF EVERYTHING include this lace top and maxi skirt. Hurry though – quantities are limited and the sale ends Friday, October 16, 2015 11:59PM PST! Don’t miss out on getting this amazing skirt for under $60! 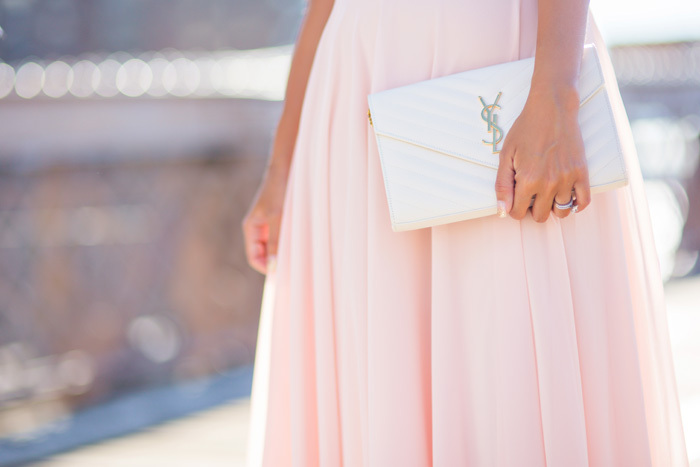 Clutch – Saint Laurent. Love also this ONE. Such a romantic outfit and the round-frame sunnies are so cute too! Love your blog! What a great giveaway. I would probably splurge out on a great piece from Burberry, or maybe some Hunter Boots! It’s coming back in stock late March! HOW WOULD WE KNOW IT WHEN IT WILL BE STOCKED ? DO YOU HAVE ANY CODE FOR DISCOUNT?